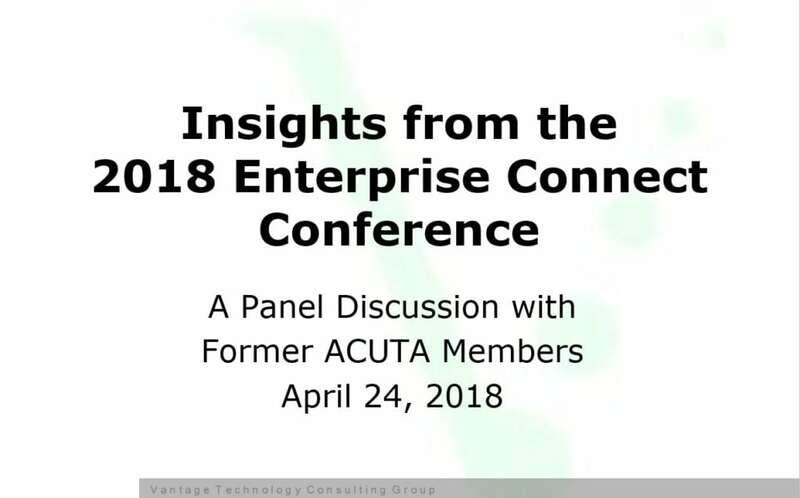 How Did the Enterprise Connect-ACUTA Panel Discussion Come About? For nearly 50 years, ACUTA promoted knowledge share and collaboration among higher education professionals responsible for telecommunication systems. Since ACUTA was dissolved in 2017, former members have looked for ways to stay connected with former colleagues. At the most recent Enterprise Connect Conference (EC18) a group of former ACUTA members got together for a brief meet-up. We decidedthat other ACUTA members who were unable to attend EC18 might appreciate a round-table discussion/webinar about our conference experiences and whether the event was useful from a higher education standpoint. Who Participated in the Panel Discussion? The panel was moderated by Geoff Tritsch from Vantage Technology Consulting Group with technical support was provided by Jon Young from Vantage. Why did you decide to attend Enterprise Connect (EC)? Were there particular issues, topics, or concerns you were hoping to learn more about? What were they? What would you say were the top 3 recurring themes or topics at this years’ EC? How do those themes or topics apply to higher education? Were there any particular presentations or events that stood out to you? What were they and why? Was this your first EC? Will you attend again? Why or why not? Unlike ACUTA which was strictly focused on higher education, Enterprise Connect is a broader trade show where vendors can showcase and announce new products and capabilities. The show tends to reflect the general sensibilities of the communications marketplace and reflect the latest trends and hype. The recurring themes this year were collaboration and contact centers, especially how Bots/AI, analytics, voice recognition, and omni-channel communications relate to user experience in contact centers. Almost all of the featured solutions were cloud-based. While most of these capabilities have some application in the smaller, focused contact centers in higher education, the return on investment is difficult to quantify and adoption will be gradual. Each of the participants recommended attending the conference to stay current with the latest trends and technologies. However, they unanimously agreed that it is important to do your homework before you attend to identify sessions, arrange vendor meetings and coordinate meetups with former ACUTA colleagues. Enterprise Connect is the leading conference and exhibition for enterprise communications and collaboration in North America. Enterprise Connect 2019 is scheduled for March 2019 at the Gaylord Palms Hotel & Convention Center in Kissimmee, Florida.